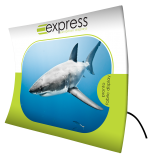 Create a stunning branded back wall with a curved pop up display stand. Reaching up to 2.2 metres in height and up to 5 metres wide, there’s plenty of branding space available to create a truly customised back drop display for your next event. 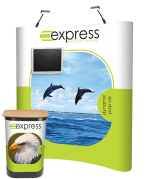 Pop up displays are one the most popular event and exhibition displays out there. Read more below to find out why, or talk to a friendly member of our team today on 0808 163 6481. 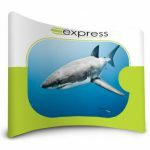 What is a curved pop up stand? A standard pop up stand consists of a lattice frame that opens and closes in a concertina style, and a set of PVC graphic panels that attaches to the frame. 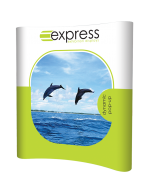 The only difference with a curved pop up display stand is that the frame slightly curves inwards to create the (yes you guessed it) curved effect. The width of the panels are slightly different to straight pop up displays but they are still attached in the same way. What sizes of curved pop ups are available? There are three sizes to choose from: 3×2, 3×3 and 3×4. It’s important to note that these numbers are not a metric reference. They simply refer to how big the frame is. As an example, 3×3 indicates the grid reference on the frame being three grids wide, by three grids high. Custom sizes are also available on request – so please don’t hesitate in calling us to find out more. Where would I use pop up stands? Why would I want a curved pop up display? As well as being large in size, they’re also incredibly portable. 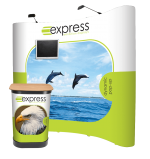 Curved pop up display stands make the perfect display to accompany all the events you intend to exhibit at. The frame and PVC graphics neatly fit in the wheeled case (available as an accessory) for easy transportation. If that’s not enough, the case can also be converted into an event counter by adding a graphic wrap and counter top to fit on the case – all available as a kit option. Screen mount options are also available as added extras. A screen mount will provide the option of adding a screen to any cross section of the frame on your curved pop up stand. Ideal for adding another level of engagement to your display. There are limitations to the size and weight of screens that can be fitted onto the frame, so please call us or use our live chat system to find out more about our screen mount options. 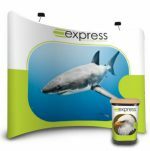 Consider a curved pop up display as a long term investment. As long as they are looked after properly and stored securely, pop ups can last years without the need to replace anything. As well as this, if you are looking to update your graphics with new messages, there’s no need to purchase a whole new display. Only a new set of graphics is needed. 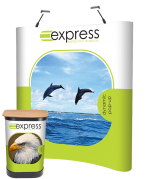 Exhibition pop up stands are easy and quick to assemble. We recommend two people for assembling, which takes less than five minutes. But one person is more than enough to assemble in ten minutes. Open the concertina style frame fully. (The below magnetic connectors should join together). Add the magnetic bars to the frame. Hook the numbered PVC graphic panels to the top of the frame. Ensure alignment is accurate and smooth down the PVC panel along the magnetic bars to seal. If you’re wondering why magnetic bars are added to the frame, it’s because the PVC panels are lined with magnetic strips – which allows the panels to attach to the frame and create a seamless effect. 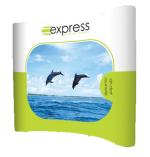 Give us a call today on 0808 163 6481 or use our live chat system during working hours for more information on our curved pop up stands.